Jessica Ramos, Inventory Analyst, Global Inventory Control, Mary Kay Inc., was thrilled to be expecting her first child in November 2015. In her second trimester – only one week after sharing the joyful news with friends and family – she received a shocking diagnosis of breast cancer. As Jessica undergoes treatment while pregnant, she looks forward to having a healthy baby and reminds us all about the importance of taking care of our health. I’m pregnant! I was 14 weeks along before I finally announced my pregnancy to my family, friends and co-workers. I was still on an emotional high when in an instant, I felt as though my life had been changed forever. A week after my happy announcement, I found out I had breast cancer and then had to share this devastating news with my loved ones. I felt a tingling sensation in my breast while watching TV one evening. When I touched the spot, I felt a lump. As a precaution, my physician immediately sent me to a specialist. Days later, imaging tests and a biopsy confirmed I had Stage II breast cancer. At first, my husband, Jason, and I were devastated. We had been anxiously waiting a long time for this baby to come. I now know my baby boy, Blake, came exactly when he was supposed to; he came just in time to save my life! I truly believe that if it wasn’t for him, I would not have found my cancer so early. My cancer is estrogen and progesterone positive, which means it feeds off of my pregnancy hormones. My surgeon said the lump has probably been there for 1-2 years, but it grew larger once I became pregnant due to my increased hormone levels. There is no history of breast cancer in my family. My mother is 78 and perfectly healthy! I thought, “Why me at only 34?” Shortly after I was diagnosed, I learned that 85% of women with a breast cancer diagnosis do not have a family history of this disease. I have also learned that “breast cancer is the most common cancer in pregnant women, and it occurs in about 1 in 3,000 pregnant women.” (www.cancer.gov) The day after my diagnosis, Jason and I began our baby registry. We decided to focus on the positive things happening in our lives. It was time to start getting ready for our baby! The following week, I underwent minor surgery to have a port inserted so I could begin my four-month regime of chemotherapy immediately. Blake was born four weeks early, on November 21, because my doctors didn't want me to go too long without any treatment. Two days after his birth, I had a lumpectomy. I am still unsure of my treatment plan after I deliver Blake, but I am hopeful my cancer will be gone! There is no way I could have made it this far in my journey without all of the love and support I have received. I feel so fortunate to have a job I enjoy at a company I LOVE! My managers and co-workers have contributed to my happiness at work each and every day. Even before I had cancer, I knew I was blessed to work in such a great department. It definitely makes things easier when you have a team of people by your side cheering you on the entire way. 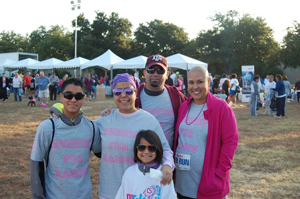 ‍Jessica's family members lovingly support her at the 2015 MK5K®: left to right: Caleb (nephew); Priscilla (sister-in-law); Abby (niece); Edmond (brother-in-law); and Jessica Ramos. 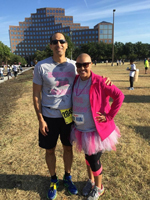 ‍“Runnin' for Ramos”, a team of co-workers, family and friends – 194 donors strong – rally to support Jessica at the 2015 MK5K® and raise funds in her honor for The Mary Kay Foundation to end women's cancers and domestic violence. 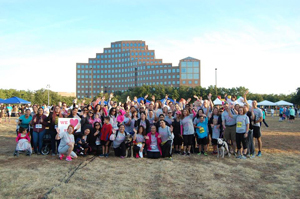 Nearly 200 join “Runnin’ for Ramos” team at the 2015 MK5K® Fun Run and Walk. Rallying a team of co-workers, family and friends to honor Jessica Ramos and back the efforts to end women’s cancers seemed a natural thing to do according to “Runnin’ for Ramos” team spokesperson Jessica Crawford, Supervisor, Global Inventory Control, Mary Kay Inc. A dedicated group of 194 donators, including 130 participants rounding the course, pushed far beyond their original goal of $1,000, raising an extraordinary $5,945 for The Mary Kay Foundation. Jessica Crawford and her teammates echo they are proud to be part of the Mary Kay family and feel overwhelmed by the outpouring of love and support for this team. I was filled with gratitude when my department created the “Runnin’ for Ramos” team for the MK5K®. I was so touched and felt so loved! It was great to see all my friends and family there as well. Even a few sorority sisters from college who I hadn’t seen in years showed up! It was a fabulous day, one that I will never forget. I look forward to participating in the event again as a cancer survivor, pushing baby Blake in his stroller, of course! I’m in awe and overwhelmed with joy that “Runnin’ for Ramos” raised almost $6,000! I’m so happy that it will support The Mary Kay Foundation to help other women who also are fighting for their lives. 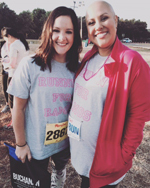 ‍"Runnin' for Ramos" team spokesperson Jessica Crawford, Supervisor, Global Inventory Control, Mary Kay Inc., (on left) encourages the dynamic team to raise $5,945 for The Mary Kay Foundation℠ at the 2015 MK5K®. For Jessica’s loving husband Jason, the shock of her cancer diagnosis diminished as she responded well to treatments. He is proud of her strength and positive, upbeat attitude. He looks forward to being parents, and he knows Jessica will be a great mom. ‍Mike Ringsdorf, Director of Inventory Control, Mary Kay Inc,. cheers on Jessica as she rocks her pink tutu and prepares to hit the trail. I found it so ironic that my body was creating life and trying to kill me at the same time, but my treatment was working and I had a healthy, growing baby. Blake was always very active! I felt him moving around every single day. It was my favorite part of being pregnant! Although I wish I didn’t have cancer, it has taught me to realize that people are compassionate and for that, I am thankful. I have received so much love from family, friends and even strangers. I will never, ever take this love and support for granted. I feel good and have learned to not take my health for granted either. I encourage everyone to take care of themselves. And I remind women to regularly do your self-exams and get your mammograms. I have learned we never know what tomorrow may bring. 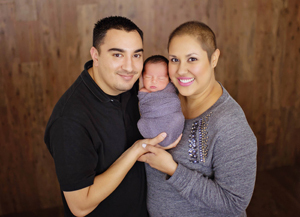 Update: Jessica and Jason Ramos joyfully welcomed healthy baby Blake on Nov. 21, 2015. They are thrilled to be parents! In mid-January, 2016, Jessica began a new regimen: 12 weeks of chemotherapy, followed by six weeks of radiation. She hopes her treatment is complete by summer. ‍Jason and Jessica Ramos joyfully welcomed baby Blake into the world on Nov. 21, 2015!